I think non-compliance with state and federal regulations is often not deliberate, but due to a lack of understanding of the regulation itself. In the world of long-term care, regulations are a confusing yet vital part of the profession. Imagine, rather than digging through book after book to find a piece of information, there was a comprehensive, easy-to-read reference guide for all things long-term care. 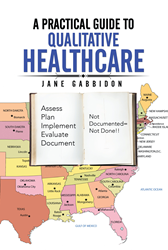 In her new book, “A Practical Guide to Qualitative Healthcare,” author Jane Gabbidon helps long-term care professionals and those studying to enter the field better understand industry regulations and in turn, provide higher quality care for patients. Gabbidon is currently a corporate clinical consultant at a large healthcare organization that manages and owns over 29 nursing homes, but previously worked as a long-term care nurse for 20 years. “A Practical Guide to Qualitative Healthcare” not only summarizes these industry regulations, but does so in conjunction with Gabbidon’s own proven, tried, evidence-based practices. “When everyone in a facility, from housekeeping to the head nurse, have an understanding of all areas if the regulations, it translates into quality care for residents,” Gabbidon said. Jane Gabbidon was born in St. Thomas, United States Virgin Islands, but grew up in Montserrat, British West Indies. At seventeen, she migrated to the Bronx, N.Y. and graduated from Fordham University with a degree in biology. Gabbidon then went on to receive her nursing degree from Borough of Manhattan Community College and has now been practicing long-term care, specifically in nursing homes, for over eighteen years. Gabbidon currently resides in Valley Stream, N.Y. with her husband and two children.